Daily Equine Forum - Brrrr It's Cold Outside! Anyone have some good tips to share to keep your horse from getting "barn" fever in these frigid temperatures? Joe is never stalled. He can choose where he wants to spend his time between being in the barn or being outside. During the day, he has access to the pasture but at night, he & the donks are restricted to the dry lot & barn. He chooses to be outside most of the time. I do have shavings in the stall area so he & the donks can and sometimes do bed down there but many nights they camp outside. I offer more hay when it's this cold but don't increase their feed. They have access to heated water 24/7. We have freezing rain in the forecast and I'm debating on what to do. Depending on how heavy it is, I'll probably restrict them to just the barn lot. I'll put down shavings to the water tank & hope they have enough sense to stay under the lean! I've blanketed Joe a very few times. The first winter I had him because he'd been stalled before I bought him. A couple of times, I've but a fleece sheet on him till he dried out because he'd been out & gotten wet then the temps dropped. Horses that are in good health & weight do just fine as long as they have shelter from the wind and precip and have plenty of fresh water and good hay. My horses run out from the barn and shelter when it rains....think the noise scares them. Have no idea if snow makes noise ...could that be why they don't go in their shelters? Around New Years it was COLD here (30s is COLD!! )...snow in parts of non-mountains in the county. My solar on the fritz and no heat in the house! I rarely use the heat but would have if working! Even the horses didn't fidget when blanketed. I'm enjoying it...was so danged hot last year, it's a nice break. Our guys spend the night in their stalls in our insulated barn. We keep the doors slightly open to allow some ventilation to avoid the moisture build up. Automatic waterers in the barn freeze when the temperatures drop below -10C (18F) so we pail water with warm water. We have an insulated heated tack room with a hot water heater. In the daytime they are turned out into our 50X100 indoor arena with full access to an outdoor riding ring. They stay in the arena most days when it is cold and the wind is blowing. We put enough heated water in the water trough to last them for the day. They really like the soft footing and get rid of excess energy regularly. Last night was -16C (3F) with a pretty strong south west wind. My horses are 19, coming 21, and coming 29. The long 20 & 28 year olds have been with me since they were barely old enough to be broke. The 19 and long 28 year olds both have some serious health issues and have been at a point where they are more content spending longer periods in the barn, when the weather's cold/wet/blustery. I send everyone out for at least five hours every day, whether they like it or not. There have been some nasty weather days, they would not leave the paddock choosing to stay under the overhang and/or the run-in stall and watch the neighbor's Angus up on the ridge. It's unusual for my horses to be stalled. They were last night and still are because of the threat of freezing rain, but since that didn't happen they will go out later. They HATE being confined to stalls. They like to pretend they are wild horses and dig through the snow for grass. Dani self exercises. 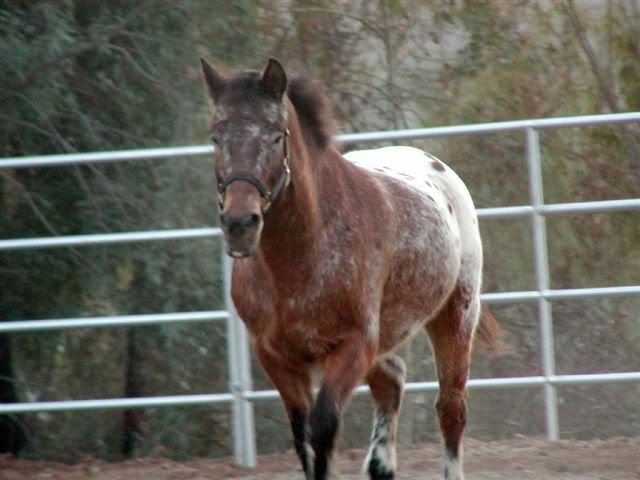 If they are confined to the paddock she will canter down to the far end and trot back to the barn repeatedly.